The rise and fall of Kanye and Drake. Nothing lasts forever, and the salient feature of dynasties is that they come to an end. Kanye West and Drake have been figuratively warring over the airwaves for about a decade now, with neither party—nor their affiliated hip-hop constellations—quite ready to give up the battle for control of the summer. Winning that war means winning the year: Nothing goes quite so well with hot weather as a hot beat, and these two have them in spades. The rivalry came to a head this year with the G.O.O.D. Music release of Pusha T’s sublime Daytona, almost entirely produced by West, and Drake’s messier Scorpion. On “Infrared,” Daytona’s last track, Pusha makes the rivalry explicit: He follows up on a relatively old beef, accusing Drake of relying on a ghostwriter for some of his lyrics. (It’s important to note that the beef—between Lil Wayne’s Cash Money label, which hosts Drake, and the Clipse, which granted Pusha T his entrée into rap stardom—began, in 2006, over who wore the A Bathing Ape brand first. It’s that old, and that petty.) Drake responded with a couple of anemic diss tracks, “Duppy Freestyle” and “I’m Upset,” in which the pop star variously announces he’s in shock at Pusha’s audacity and is thinking about buying a semiautomatic pistol and a bulletproof vest. As many have noted, “Infrared” was a feint: Pusha fired back with “The Story of Adidon,” which featured a picture of Drake in blackface on the single’s cover, made digs at Drake’s father and mother, and revealed that the rapper was hiding a child. The beef was ultimately quashed by J Prince, the legendary CEO of the equally legendary Rap-A-Lot Records, but it seems that Pusha and Kanye have won the summer again. 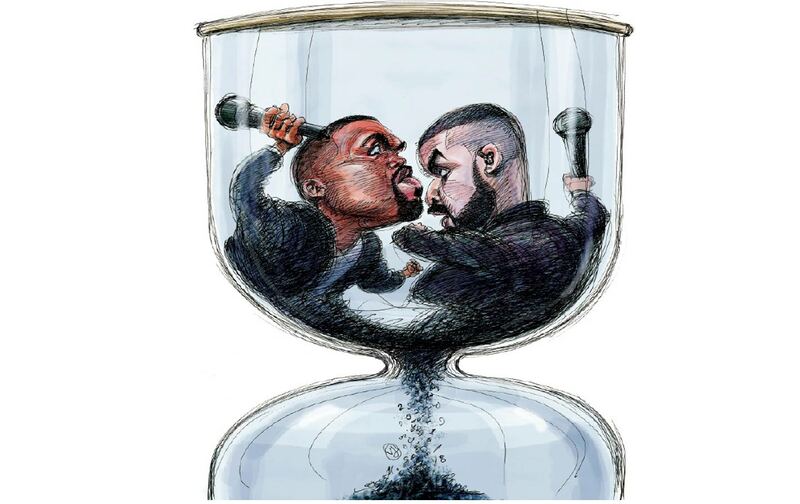 The theatrics, which took place in May, may have generated some excitement, but Kanye and Drake share a larger problem: Their time in the spotlight as the kings of rap and pop, respectively, appears to be coming to an end. Even as Kanye attempts to solidify his position as rap’s preeminent auteur with a spate of G.O.O.D. Music albums, and Drake moves to secure his legacy with Scorpion, both seem to have missed their slide into irrelevance. Hip-hop is a young person’s game; so is pop. A new class of unaffiliated artists, working in the shadow of these two giants, have been awaiting their turn in the spotlight; this summer, they might be the real winners. In an aesthetically savvy move, Kanye announced earlier this year that he’d be releasing five albums by well-known artists in the G.O.O.D. Music stable, all produced by him. They included Nas’s first album in six years, a collaboration with Kid Cudi, a solo outing from Teyana Taylor, and the albums by Pusha T and West himself, though aside from Daytona, the efforts have been mostly unremarkable. Add to this his embrace of Trump and his outrageous tweeting, and it seems that Kanye is grasping at straws. On all of the albums, the production is characteristically his: The samples are heavy and well-chosen, and even where the rapping is weak, they shine. The problem, however, remains: Nearly all of the albums are retreads of ideas that West ran through in the early ’00s. It seems his originality has gone missing. Scorpion, Drake’s fifth solo effort, suffers from the same affliction. Yet where the G.O.O.D. Music artists keep it short, Drake goes long: At 25 tracks, Scorpion is a tedious and repetitive listen that reprises all of Drizzy’s hobbyhorses—anxiety, money, naked need, problems with women, and his perpetual hope for transformation. A large part of the album has Drake addressing the rumors about his son. “Single father, I hate it when I hear it,” he confesses on “March 14.” “I used to challenge my parents on every album / Now I’m embarrassed to tell ’em I ended up as a co-parent / Always promised the family unit / I wanted it to be different because I’ve been through it / But this is the harsh truth now.” The album also finds Drake resting on his formidable laurels—animals that lose a fight but don’t die limp back home to lick their wounds. “Who’s givin’ out this much return on investment? / After my run, man, how is that even a question?” he raps on “Survival,” Scorpion’s first track. But a general sense of exhaustion wends its way throughout the album. Drake sounds tired, uninspired, and uninterested in his usual subject—himself. Meanwhile, younger artists like Cardi B and Rico Nasty have released albums that are quiet masterpieces, innovative and, above all, fresh. There’s none of the ennui or ambivalence about success that now feels characteristic of Kanye and Drake, two dudes who have been on top for so long that it’s gotten boring; there’s a flame in these younger women and their cohort that’s been missing since Views and The Life of Pablo. It’s a thrilling performance that makes Nasty one of the best rap albums of the year; even that glancing reference to Trump feels contemporary in a way that renders Kanye’s latest efforts to address his presidential fandom so much empty bunk. In “Ye vs. the People,” Kanye attempts to explain: “I feel an obligation to show people new ideas / And if you wanna hear ‘em, there go two right here / Make America Great Again had a negative perception / I took it, wore it, rocked it, gave it a new direction / Added empathy, care, and love and affection / And y’all simply questionin’ my methods”—which only proves he doesn’t get it. Nasty’s distaste for Trump is rooted in her love of black people, which is itself a political act; Kanye’s love of Trump grows out of his inability to process Trumpism as an ideology of real consequence, as something more than aesthetics. Compared to the old heads, the kids are alright. What’s frustrating about Kanye’s and Drake’s mutual decline are the occasional flashes of brilliance that the two still display. The Kanye-produced Daytona is pure old-school magic: It sounds like a classic, and will undoubtedly go down as Pusha T’s best album since he and Malice (now No Malice) made Hell Hath No Fury in 2006. “This ain’t for the conscious, this is for the mud-made monsters / Who grew up on legends from outer Yonkers / Influenced by niggas straight outta Compton, the scale never lies / I’m two-point-two incentivized,” Pusha raps on “The Games We Play.” Part of the appeal is that Pusha returned to his cocaine-dealing roots and found the ground there fallow and fertile. As a result, the bars on Daytona are some of the best of the year, and Kanye’s sample-heavy production elevates them to the sublime. As for Drake, his recent songs “God’s Plan” and “Nice for What,” both from Scorpion, are bops in the classic Drake mold, written explicitly for women (“Workin’ hard, girl, everything paid for / First-last, phone bill, car note, cable / With your phone out, gotta hit them angles,” he raps on “Nice for What”) or for his homies (“And you know me / Turn the O2 into the O3, dog / Without 40, Oli, there’d be no me / Imagine if I never met the broskies,” he says on “God’s Plan,” about his frequent collaborators). The old brilliance is there, the same ease that suffused 2011’s Take Care and 2013’s Nothing Was the Same and vaulted Drake onto the top of the charts and the world. But the world has changed. Both of the genres that Kanye and Drake defined have now moved on as a new generation—people like Cardi B and Rico Nasty and Tierra Whack—comes onto the scene. Over the last two years, a certain self-confidence has been punctured, and music has started to capture the rising sense of alarm, the realization that things might not turn out the way we thought they would. That takes ferocious sounds. If the rappers at the top of the game can’t provide them, others will.